If Republican Economic Policy is to Drive Down Wages and Ship Jobs Overseas, Then How Can They Hope to Reduce Government Dependence? There’s a bit of an internal contradiction in this tired, old republican narrative that keeps being recycled. This narrative that derides government dependence and smugly assumes that their own set of economic values reduce that dependence. But looking at republican policies, it becomes clear that those very policies foster the dependence they claim to deride. Overall republican policy has been little more than a direct assault on living wages for Americans since the mid to late 1980s. Teachers, professors, workers, scientists, people working in the public sector have all been criticized as having wages and benefits that were too high. They, first, claimed there was a need for increased efficiency. Then they targeted individual groups, leveraging a form of class envy to target college professors’ tenure, teacher benefits, the pay and benefits of any and all union workers. The result of this wide-ranging leveraging of envy to degrade the US middle class has been a lowering of overall standards of living, wages, and benefits for the larger American public. And it is this assault that has necessitated the US dependence on debt for growth for so many of its citizens. Perhaps the most obvious sign that republican policy is directly against rising standards of living for the US population at large is a broad-based opposition to the US minimum wage. Republicans often deride the need for a minimum wage at all, much less its increase even if it lags behind inflation. And, at every turn, republicans have attempted to undermine the principle supporting a minimum wage, even pushing for a return to the dark days of child labor and children competing with parents for wages. When republicans have failed to drive down wages and lower benefits, they have pushed for moving large corporations, institutional employment, and services to lower wage areas. This has occurred within the US where corporations have ‘raced to the bottom’ by moving facilities to lower wage regions in the south. The result has been a dessication of jobs in developed regions while the lower wage regions become more and more dependent on government assistance (explored more below). But the most extreme manifestation of this policy has come in the form of encouraging businesses to move production to places like China. Now, US workers are forced to compete with foreign workers in areas that are far less developed than the south. Areas that haven’t even industrialized. This creates a major distortion in which advanced society Americans are forced to compete directly with slave wage labor. At a speech to Bain investors, republican presidential candidate Mitt Romney bragged about how Chinese workers ‘lived in dormatories,’ shared bathrooms with twenty other workers, were paid 26 cents an hour, and worked extremely long shifts. In republican parlance, this is the ideal work-force. And it is this kind of workforce that is destroying the American standard of living. A wise economic mogul, Henry Ford, once noted that, in order to support business, workers required wages high enough to purchase a decent portion of the products they produced. And so Ford paid his workers enough to purchase the automobiles his factories pumped out. The same goes for American society. If you want a wealthy civilization able to enjoy the benefits of modern life, work compensation must rise to meet that aspiration. Driving down wages and shipping jobs overseas, however, creates another result — increased reliance on debt and public support. So now we come full circle. If job wages and benefits are always heading down; If jobs themselves, to greater and greater degrees, are heading overseas; then how do you still grow the economy? There are two methods — expand debt and/or expand government assistance. In the first method, credit becomes cheap and easy to access. Middle class workers, seeing their wages drop, turn to cheap credit to support families, keep their homes or purchase ever-more-expensive food and fuel. This expansion of debt creates a bubble that sustains economic growth for a while. But, overall, the unsustainable nature of debt comes crashing down and the number of poor expand. It is a sad fact that the result is that people robbed of their access to the American dream by a combination of declining wages and benefits and debt dependence become a part of a growing class of poor and disenfranchised. The only agency, at this point, able to provide assistance to these people becomes federal, state, and local governments. 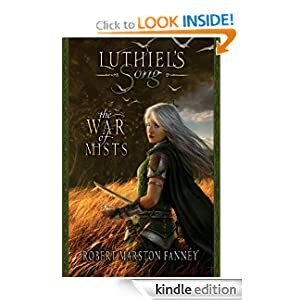 Charity organizations and churches lack the larger ability to rise to this challenge, because the size of the problem generated has become so large. In the end, the result of republican policies, therefore, becomes government dependence. One policy that has resulted in a devastating decline in wages and massive increases in individual independence has been the perpetuation of ‘right to work’ laws in many republican states. These laws remove the ability of people to organize and bargain through unions and, by extension, to participate in the wealth generation process. As a result, right to work states have seen wages decline and food stamp roles explode. Georgia, for example, has fully 19 percent of its population dependent on food stamps. In Mississippi, more than one in five people rely on government food stamps due to the work and wage destroying republican economic policies. It is a sad irony that republican rhetoric and republican policy are at diametric opposition. An analysis of policy results shows the bald lie in republican talking points. In short, republican policy is directly designed to increase need, increase, dependence, and reduce an individual’s ability to remain independent of outside support. 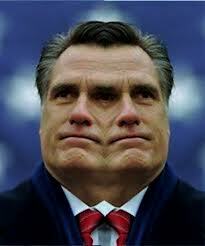 Republican policy is the very definition of dependence multiplying. Opportunities for luck and good fortune are reduced. And rewarding individual pluck, diligence, and hard work is taken away. In the end, more people must turn to the very government policies republicans attack politically — social security, medicare, medicaid, food stamps, public education — for assistance. And the end result of removing these programs while creating dependence upon them would be an explosion of American poverty. For these reasons, and for a number of others, republican economic policy is fundamentally dis-enabled to advance American recovery from the worst economic recession since the great depression. A recession, in vast part, resulting from failed republican policies. According to reports from the Wonkblog, the ongoing US drought knocked .2 percentage points off of US GDP growth during the second quarter. This figure is probably very conservative when you consider the massive impacts and total costs of this ongoing and expanding drought. The historic drought has, so far, cost America more than 77 billion dollars, or about .5 percent of annual GDP. And with NASA, the WMO, and many other climate organizations now establishing a link between this year’s extreme drought and severe weather, the intransigent and carbon emitting fossil fuel companies, who continue to seek dominance for their dirty, dangerous, and depleting products, not mother nature, are primarily to blame. If all this lost money were spent on job creation measures, it would support about three quarters of a million well-paying jobs. Such an investment would result in a big bump for US employment and overall prosperity. But that possibility is now gone as the money has been absorbed by damages. Yet drought isn’t the only avenue through which fossil fuel related damage has come to the American economy. Other severe weather events have combined with the current drought to create the most extreme year for natural disasters ever in the US. This record year follows a series of increasingly damaging years since the 1980s. The damage just keeps happening year over year, even as it is increasing overall. This year, total damage to the US economy due to weather disasters is currently well in excess of 100 billion dollars and the damage is still ongoing. Moving on from extreme weather, we can shift to other harmful fossil fuel related impacts to the US economy. The first is the ever-growing cost of liquid fuels caused by a combination of growing demand and the depleting nature of a fossil resource. Overall, fuel costs have averaged higher than $90 dollars per barrel for 2012, the cost necessary to make fracked ‘tight oils,’ like those produced by the Bakken, profitable. At 18 million barrels per day for the US, the daily cost of this consumption is nearly 1 billion dollars or around $350 billion dollars per year, more than four times the cost of oil in the early 2000s. Food also suffers from high energy prices and the stresses of drought. And with food prices rising due to increased energy costs, the public takes another hit of about an extra 50 billion dollars. The extra food costs due to drought were already counted in the 77 billion dollar figure, but they are worth mentioning again. Even leaving out other costs from externalities such as the cost of deaths and adverse health effects coming from coal, the costs of foreign wars as a result of the necessity for a stable liquid fuel supply chain, and the costs of damage to US water supplies due to fracking, the total cost of harm caused by fossil fuels currently amounts to about 400 billion dollars for this year alone or about 2.5 % of GDP. A very heavy blow. It represents the difference between the struggling economic growth we are seeing now and the much more rapid rates of growth during the 1990s when the weather was less severe and when fuel costs were much lower. We can no longer provide a rationale for a continued economic growth when the basis for that growth is assumed to be the damaging and depleting fossil fuels. The very fuels which will make the droughts continue to be more frequent and more severe, which will continue to make the weather more damaging, and which, sooner than we expected, will drive the seas to rise and threaten many of our major cities. The very fuels whose cost, averaged over time, will keep going up as they become more difficult to locate and extract. These fossil fuels, which are the source of so much harm, have now come to the point where they are no longer economical. The historic US drought that has, for more than a half a year, plagued so much of the nation continues to gobble up more land. Last week, drought covered 64.8% of the US. This week saw an expansion of moderate to exceptional conditions growing to cover 65.5% of the US land mass. This is the largest land area covered by drought since the Drought Monitor began keeping records. Though some areas in the east received rains, causing conditions to moderate there, monsoonal flows have shut down for the west, cutting off a supply of needed moisture. The loss of monsoons has resulted in the west slipping back to a hotter and drier than normal pattern, intensifying already dangerous drought conditions there. Overall, 6.12 percent of the US suffered under exceptional drought, 21.48 percent of the US suffered under extreme or exceptional drought, 42.12 percent of the US suffered under severe or worse conditions, and 65.45% of the US suffered from moderate or worse conditions. For the week, drought area expanded in all categories. The drought’s severe impacts to US river flows has continued to impair traffic on the Mississippi. Recently, traffic was halted near Granite City and at the Port of Osceola. At Osceola a dredge is currently laboring to re-open an area that has been closed for nearly a month due to low water. Traffic at Granite City backed up after Lock 27 suffered damage even as the low and narrow nearby river struggled to support a backlog of barges waiting for passage. Impacts to US farmers for this year are mostly finished. However, the persistent drought raises worries for next year. Some farmers are rushing to implement the use of new heat resistant varieties of corn while others are looking to what impacts will result from this year’s losses. A few shortages have popped up on the radar screen for next year. Most notably, it appears that the world will suffer a shortage of bacon come 2013. And though grain and cereal supplies are quite low due to droughts in the US, parts of Europe, and parts of Russia, an overall shortage has yet to materialize. Two factors are currently driving the ongoing drought in the US. The first is a long-term trend of heating and drying resulting from human caused global warming. The second is the fact that El Nino, long predicted for late 2012 to 2013, is starting to look rather weak. The most recent sea surface temperature anomaly measurements from NOAA show ENSO in a neutral to slightly positive state. This means that El Nino in the eastern Pacific, a powerful driver of weather patterns, is currently very weak. Though the World Meteorological Organization is still calling for El Nino conditions to begin within the next month, others doubt whether this El Nino will eventually form. A weak or neutral El Nino for 2013 is not likely to provide the impetus to drive out the current US drought. So with the increasing force of global warming and a failure of El Nino to provide more consistent winter storms for the US, it appears more likely that drought will persist. This forecast seems to have been validated by the most recent seasonal drought outlook which calls for expanding drought conditions through December 31rst of 2012. Such a scenario would point toward a potential for worsening US drought conditions in 2013. Drought conditions broadened to expand to cover much of the US this week even as monsoonal moisture lessened the severity of drought in some areas. According to reports from the US Drought Monitor, drought expanded to cover more than 65% of the US, the largest area ever in the Monitor’s record. A broad, contiguous swath of land from the Tennessee and Mississippi river valleys to the Rio Grand in the south, the Canadian border in the north and the California coast in the south all continue to suffer from conditions of moderate to exceptional drought. In addition, a swath of abnormally dry to severe and extreme conditions concentrating in Georgia and eastern Alabama parched parts of the eastern US. Though drought areas broadened, monsoonal moisture, usually a respite for this time of year, did cause some slight reductions in Severe to exceptional drought conditions. Overall, the areas covered by severe to exceptional drought dropped by slightly more than half a percent to reach 41.07% for this week. Much of the US’s breadbasket remained under severe to exceptional drought conditions. Farmers’ fields lay over dessicated soil. Wilted corn ears produced tiny cobs or no cobs at all. The monsoonal rains coaxed up a fresh growth of green grass. But the very dry soils underneath do not bode well for next year’s growing season, unless a long period of rain rejuvenates the soil this winter. According to reports from USA Today, this year’s drought is now expected to cost over $77 billion dollars, the third most costly weather disaster in US history after Hurricane Katrina and the 1988 drought. Areas hardest hit include Oklahoma, which just suffered from an extreme drought just last year. Texas, also hit by last year’s drought, is showing persistent or expanding drought as well. In context, climate change has brought one year of record flooding to the US, followed by a year of record drought. These extreme swings from one condition to the next are not helpful to agriculture and crop viability. Overall, the trend toward drying and swings between more and more extreme conditions is likely to continue for much of the US over the coming decade and worsening into the the 2020s and 2030s. This year’s drought also shows the potential to worsen into next year should a recovery not come this winter. Overall, this prospect is appearing more and more likely. According to the most recent drought forecast, much of the country is expected to show worsening drought. Only a small region is expected to show persistent or improving conditions and a very small region is expected to show improving conditions. Perhaps, more ominously, the northwest, so far spared the worse harms of the current drought, is expected to fall into drought conditions over the next few months. Six days after the typical end to the Arctic melt season shows some pretty clear evidence of a beginning to seasonal re-freeze. JAXA shows sea ice extent more than 250,000 square kilometers above the record low set just a few days ago. 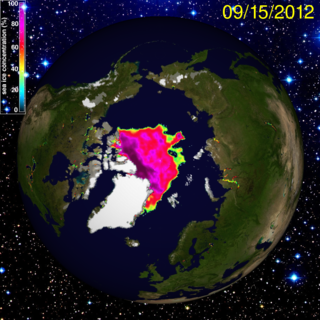 Cryosphere Today is showing sea ice area about 150,000 square kilometers above the record low also set at that time. Though it is possible for melt to resume, each day of refreeze makes that potential less likely. It is worth noting that NSIDC seems to also be calling for the melt season’s end with its new record low value of 3.41 million square kilometers having posted on September 16th and called the final low on September 19th. 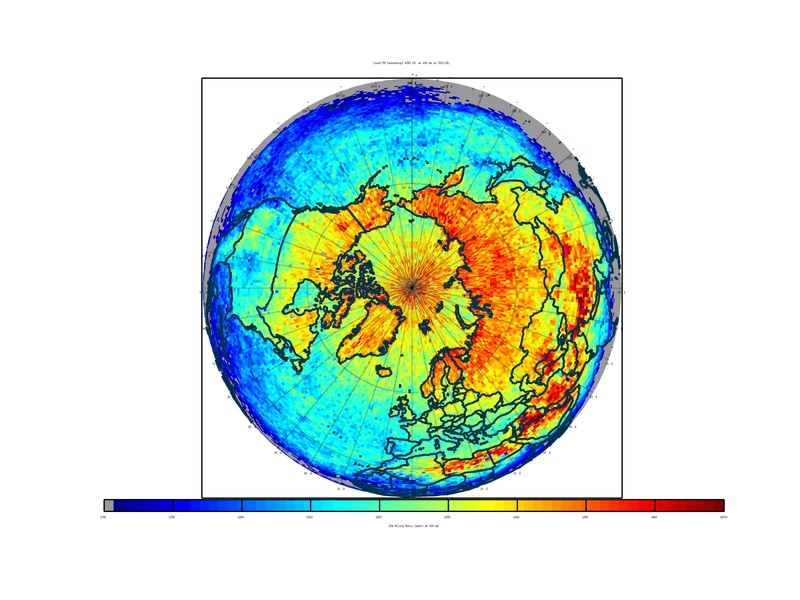 This value of 3.41 million square kilometers is a departure of 760,000 square kilometers below the record low set in 2007 and an 18% loss since that record low year. Total losses for NSIDC sea ice extent are now 66% below best estimates for sea ice extent averages in the 1950s, 57% from the 1979 figure, 51% below the 1979-2008 average, and 18% below the last record low. By all long, medium, and short term measures, these departures show a consistent and devastating trend of sea ice extent loss. Volume losses, according to PIOMAS are now 78% below 1979, but final measurements for September aren’t yet in. So we can, potentially, expect greater volume losses once PIOMAS issues its report for this month. 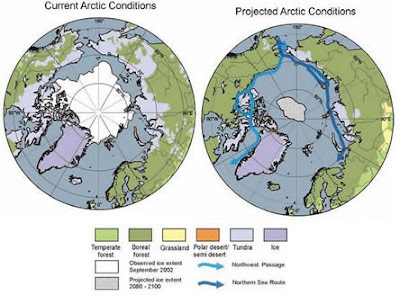 The Arctic has suffered a devastating blow from which it is unlikely to significantly recover. 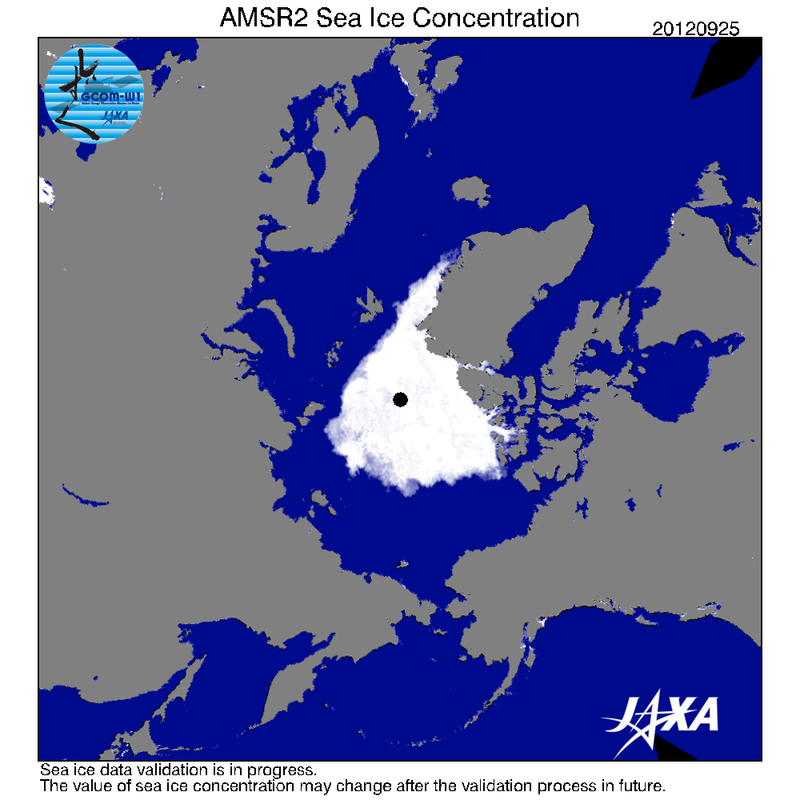 Sea ice measures for area are more than 2.44 million square kilometers below the average for 1979-2008 and more than 3.5 million square kilometers below the typical measurement for this time of year in 1979. Measurements are also still about 500,000 square kilometers below the values during the extreme record melt season of 2007. That said, thin, one-year ice will likely show significant growth during the fall and winter months even as average values are likely to remain below the baseline extent for 1979-2008. In fact,with values so low for this year, it is possible that a number of months during fall and winter 2012-2013 will see record low averages and that summer 2013 will emerge more fragile than even 2012. These measurements and assessments, if nothing else, show that this refreeze is just a small respite in a much larger melt trend that has been ongoing since at least the 1950s and is trending for an ice-free or near ice-free Arctic within the next 3-20 years. Each year, as the sun begins to fall toward the southern sky, cold air begins to accumulate in the Arctic, bringing an end to the summer sea ice melt season. On average, this date falls on September 15th. This year, the 15th came and went. But a devastating record sea ice loss continues. A loss whose damage to the Arctic cryosphere now rivals that of 2007. 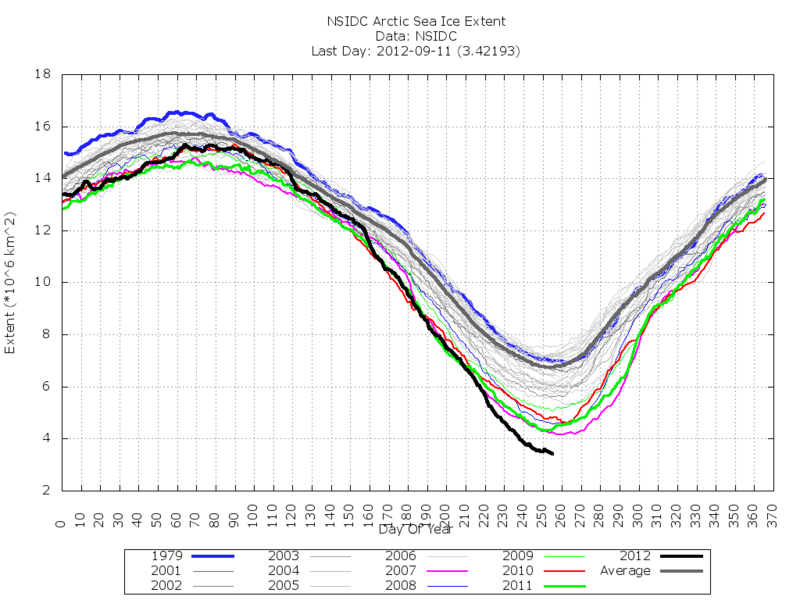 Today, Arctic sea ice extent reached new record lows for both JAXA and NSIDC. JAXA is showing sea ice extent at 3.475 million square kilometers. NSIDC is currently at 3.39 million square kilometers, also a new record low. Sea ice area reached a new record low yesterday with Cryosphere Today showing 2.234 million square kilometers. Losses for sea ice extent are 19% below the record low level set in 2007. 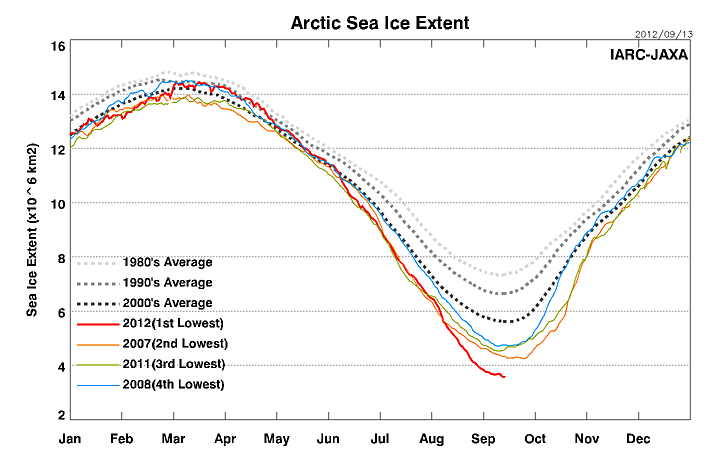 Losses for sea ice area are 23% below the record set in 2011. These percent losses are very close to the massive declines seen in 2007. With values now approaching 800,000 square kilometers, totals for 2012 are also now nearing the 1.1 million square kilometer losses experienced in 2007. At current rates of loss, it seems unlikely that 2012 will break much more than 800,000 square kilometers below past records. 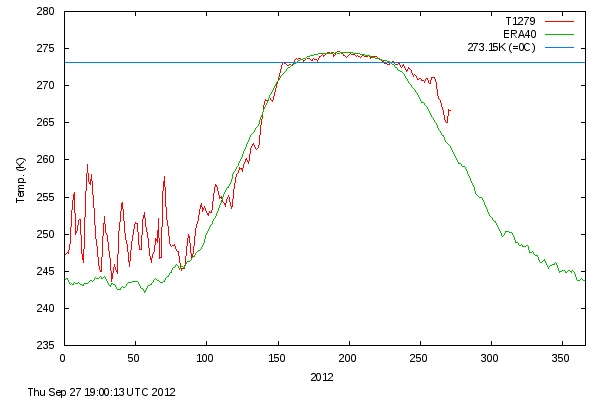 However, as the days go by, the 2012 melt season continues to surprise. It appears that above average temperatures for this time of year are at least partially responsible for the ongoing melt. During a time when temperatures should be rapidly falling, they are, instead, remaining about level. Current average temperatures for the Arctic environment above the 80th parallel are now about -1.5 degrees Celsius. Though this temperature is below the freezing point of fresh water, salt water tends to freeze at -2 degrees Celsius. The result is that the balance of the Arctic environment is still tipped toward melting. And you can see well enough that these temperatures are becoming more and more anomalous as September continues. In addition, it is worth noting that weather conditions do not appear to particularly favor melt. In fact, we’ve just passed through a set of conditions that would have favored stabilization or freezing in a normal Arctic year. So it would seem that increasing heat content in the Arctic environment is the most likely culprit for this year’s melt. Before I close out this blog for the evening, I’d like to let you know that I’m in Myrtle Beach, South Carolina for a one week vacation with family. We’re currently renting a beach house on the ocean and, for whatever reason, the beach directly in front of the house is terribly eroded. Only a small dune protects the house from what seems to be a hungry sea. In addition, at high tide, twice each day, the ocean waves come lapping up against the dunes. So, with each passing high tide, more and more sand is washed out to sea. Earlier today, my wife and I went for a walk along the shore. On this particular walk we encountered not less than five homes which appear to have sustained damage from the encroaching seas. A number of other homes shelter behind sea walls. One house had an enormous pile of sand dumped in front of its property. It seemed that this sand had been deposited there by a dump truck as a measure to prevent an inflow of the encroaching seas. A large tide pool had formed directly in front of some of these imperiled homes, replacing a normal dune line and undercutting beach walkways. I’ll do my best to get pictures for tomorrow’s blog so you may have a visual reference. In any case, I find it somewhat ironic that a location my family chose shows such obvious effects of rising seas. For sea ice melt trackers, 2007 was a long, long time ago. Things were quite a bit different then, before that record year obliterated all past records for sea ice loss and made projections like the one above seem silly and quaint. Since these predictions were made, we’ve lost nearly 2 million square kilometers of sea ice — an area nearly the size of Greenland and melt rates indicate an end to Arctic sea ice by late summer within the next decade. If such an event were to occur, it will happen more than 60 years ahead of IPCC predictions. As an aside, it is worth noting that the graph doesn’t represent what a small remnant of sea ice will probably look like. 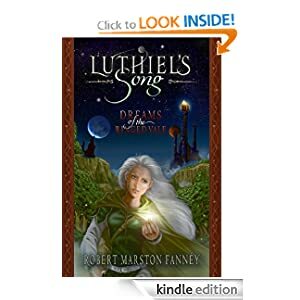 The actual north pole will be free of ice and all that remains will huddle against the north of Greenland for protection and insulation from the insults of heat from all directions. As the record melt season of 2012 has continued to progress, more and more Arctic scientists are validating a melt trend that is devastating the northern polar sea ice. PIOMAS has been collecting data that shows a potential for sea ice disintegration by end of summer within the next 5-10 years. And this summer a team of British researchers validated PIOMAS findings using satellite data. Then, Cambridge professor and sea ice expert Peter Wadhams made a stunning prediction that most sea ice could be gone by 2015. Now, the Norwegian Polar Institute is chiming in. The Arctic sea-ice big melt of 2012 “has taken us by surprise and we must adjust our understanding of the system and we must adjust our science and we must adjust our feelings for the nature around us”, says Kim Holmen, NPI international director. What has happened is that nature is moving the goal posts faster than scientists can establish them. The heat we are seeing doing work on the sea ice now. What will happen to it once it has finished with the sea ice? It’s not just going to sit there in the ocean for decades and centuries. 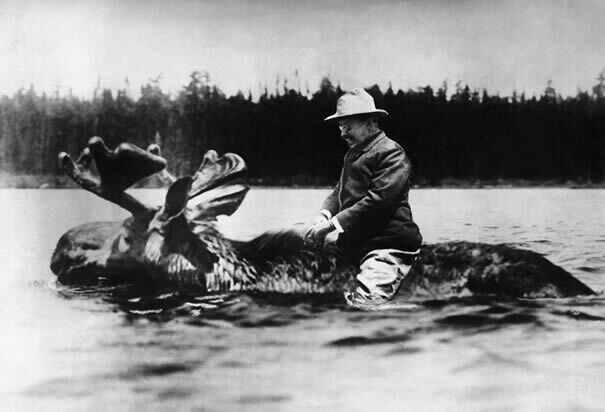 It’s going to go right to work on Greenland. And we can see that happening now. According to scientific reports, the tipping point for Greenland ice melt is between .8 and 3.2 degrees Celsius above pre-industrial average. We are at .8 C now. And the forcing of human climate change keeps pushing that number higher. This summer saw a massive new record melt for Greenland and it’s really just the beginning. IPCC findings were for a very mild sea level increase for the 21rst Century. However, with the sea ice melting so fast and Greenland and West Antarctica next in the line of fire, it appears that these break-downs are more and more likely to occur sooner. Possibly starting within this decade and intensifying through mid century. It is more likely that a 2 meter rise or greater will occur before 2050, if greenhouse gas emissions aren’t dramatically brought into check. And based on where we are now, it would take a major effort to remove carbon from the atmosphere to prevent sea level rises in excess of 1 meter by end of century. As we’ve noted in previous posts, a 365-405 ppm level of CO2 is enough to melt both Greenland and West Antarctica and raise sea levels up to 75 feet. We are in this range now. Yet with current emissions and amplifying feedbacks from traditional carbon sinks, it looks like we are on track for between 450 and 550 ppm CO2 by mid-century. 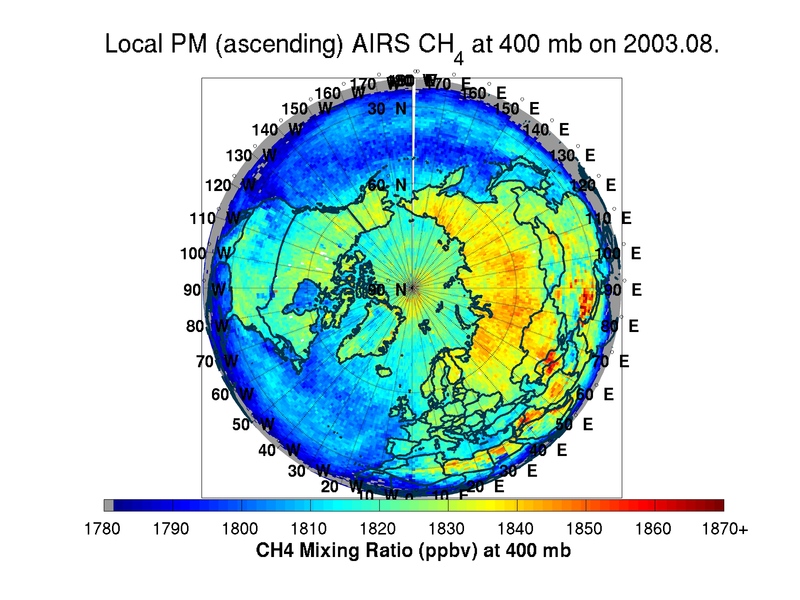 At 550 ppm CO2, there is enough heat energy in the atmosphere to take out all the ice sheets. This is a very powerful forcing that will almost surely have gone to work substantially softening Greenland and West Antarctica by the period of 2040-2060. The goal posts are moving swiftly and it is fair to say that human-caused greenhouse gas emissions are both knocking Earth out of its comfortable homeostasis as well as knocking the once static and slow-seeming study of climate into a period of rapid change. Arctic Sea Ice extended its fall into record low territory for two out of three major indexes today. JAXA sea ice fell by about 26,000 square kilometers to touch 3.569 million square kilometers of sea ice extent. Cryosphere Today showed another fall in sea ice area to 2.24 million square kilometers, a drop of 23,000 square kilometers from the day before. NSIDC continued to hover within 30,000 square kilometers of the record low it set on Wednesday. The end to a typical melt season is now just one day away. However, sea ice melt trends, with new lows being set on a daily basis, make it highly uncertain that melt will end by that date. Given the current rates of decline, and the highly volatile nature of this year’s melt season, it appears possible that new record lows for at least some sea ice measures will continue beyond the 15th. And considering the fact that a somewhat robust melt is still occurring over certain parts of the sea ice, there does appear to be a possibility that melt may extend for a substantial period beyond the traditional date for end of melt. All values are now approaching or have exceeded the 700,000 square kilometer loss mark and it would only take a single anomalous melt day to push the NSIDC extent loss over 800,000 square kilometers. The amount of melt for 2012 has now approached but not exceeded the record losses of 2007 when more than a million square kilometers of sea ice were lost in one year. However, percent losses are much closer to the 2007. NSIDC has now seen an 18% drop in sea ice extent. 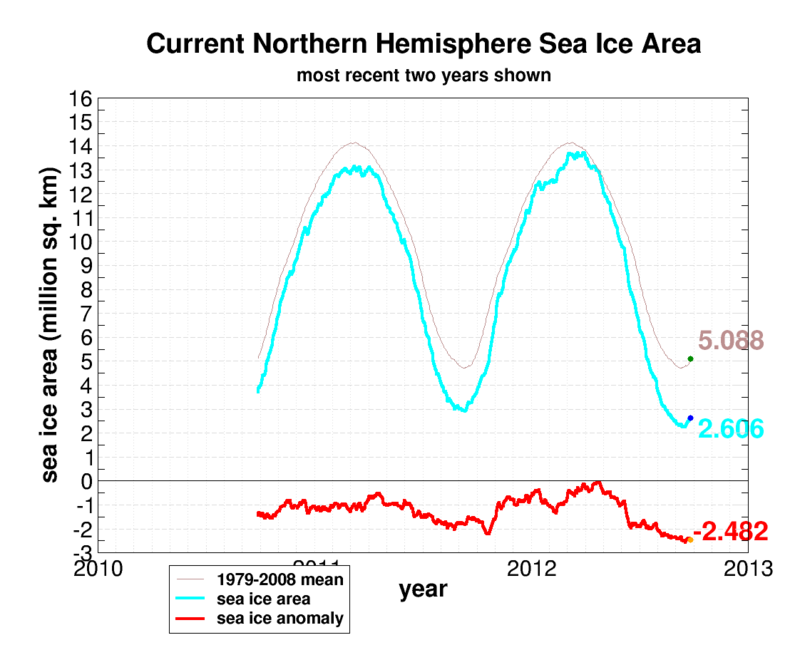 Cryosphere Today has seen a 24% drop in sea ice area. These percent losses are roughly equal to those of 2007 which saw falls in the low to mid 20% range. Looking at the sea ice, we can see continued rapid losses in the region of the Laptev sea even as a slow growth is occurring north of Canada and Alaska. The balance between the melt and freeze in these respective regions will likely determine losses or gains in sea ice over the days to come. Temperatures for the region above the 80th parallel continue to show a slow decline. But the rate of drop is much, much slower than normal for this time of year. Last week temperatures were about 3 degrees C above average for this time of year. Now, they are about 4 degrees C above average. This slow rate of temperature decline combined with a number of influences likely transporting heat energy into the Arctic are likely contributing to continued ice sheet declines so late in the season. However, the underlying factor for all these extreme and unprecedented events continues to be human caused global warming. Over the past week, drought conditions in the US broadened, covering more land area. Overall, 64% of the US is now suffering from some level of drought. Extreme and exceptional drought conditions persisted with only a slightly smaller area, 21.09% of the US, experiencing these conditions. Cooler air over much of the US has brought some relief. Wetter conditions have also mitigated some drought in the eastern part of the country. However, drier fall conditions for large swaths of the country seem to be taking back much of this benefit. Overall, conditions in the eastern US improved with areas around the immediate lower Mississippi valley improving as well. However, drought conditions expanded through much of the west-central and western US. Food conditions, though bad, appear to have stabilized at a level short of a crisis. Corn prices have come down about 10% from record highs in August. Meanwhile, wheat prices are still about 50% higher than they were before the drought. Droughts in Europe and Russia as well as a late start to India’s Monsoon Season have resulted in stresses to world food availability and pushed global prices higher. Though stabilized somewhat, the world food situation is still tenuous and fragile. Any further crisis or impacts would likely have detrimental effects. Over the next five days, a storm system is expected to bring much-needed rain to areas of Texas and Oklahoma. Rainfall totals, however, aren’t likely to end drought conditions in these hard-hit regions. Over the next ten days, the west is expected to continue drying out. In context, the fact that drought conditions in the US are still expanding to cover larger areas is worrisome. Long-term climate change dictates that the US will grow drier and drier, experiencing conditions like that of the Dust Bowl with regular frequency. We aren’t currently at that point in the warming picture. However, we are experiencing global warming enhanced dryness and extreme weather on top of a typical trend. So any normal drying event will now seem abnormal and much stronger. Abnormal events may result in what were previously 100 year or greater events. The fifty year drought is still ongoing. Its land area is growing. 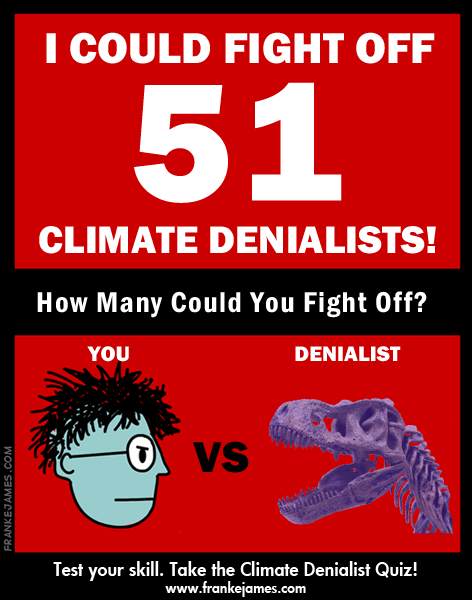 And though the long-term forecast is for some mitigation, there is still no end in sight. The above video graphically depicts sea ice volume losses as measured by PIOMAS since 1979. Overall losses during the period of 1979 to this fall have been 78% of sea ice volume. It is these massive losses in volume that have lead some scientists and researchers to predict the potential for ice-free seas during late summer within the next decade. Joe Romm and many others are starting to call these massive losses a ‘Death Spiral.’ When looking at trends for sea ice loss, death spiral does appear to be what is, indeed, happening. Another video, shown below, gives a graphic representation of sea ice extent loss since 1979. Take a look at the graph on the right hand side of the visual measure. It provides a good visualization of where sea ice extent values, now 54% lower than 1979 are heading. 2012 is the Arctic melt season to defy all previous expectation. Despite weather conditions that would enhance-refreezing, melt in important measures continues. According to NSIDC, sea ice extent is now 3.42 million square kilometers. This value is three quarters of a million square kilometers below the record low set in 2007. In total, this represents an 18% decline from the record low values set in 2007. Other measures, including Cryosphere Today and JAXA showed sea ice melting back to near record values over the past 24 hours. It appears that JAXA may have edged out its old, unadjusted record by a small margin of about 1,900 square kilometers to reach a new record low for today. 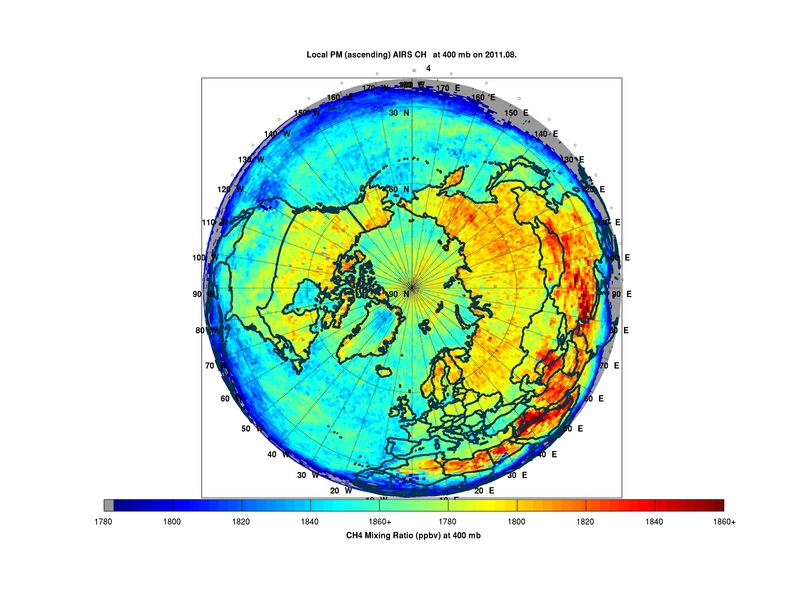 Currently Cryosphere today is showing 2.315 million square kilometers of sea ice area (within 20,000 square kilometers of the record) and JAXA is showing 3.591 million square kilometers of sea ice extent. Anomalies for this time of year are starting to get very high. Cryosphere Today is showing that sea ice area is now less than half the average for this time of year during the already low period of 1979-2008. NSIDC’s measure for sea ice extent is now about 54% lower than it was in 1979. These values are about 66% lower than our best measurements for the 1950s. Sea ice volume is now 78% percent lower than in 1979. By any stretch, these measures represent a massive and devastating loss of sea ice. We are now in the range of 600,000 – 800,000 square kilometers below record levels that this site has been estimating for end of season melt. Given these extremely low values and the current weather situation in the Arctic, I would expect stabilization with the potential for one or two new lows with a general move toward re-freeze within the next 2-3 weeks. That said, temperatures for the Arctic are still very high for this time of year. And it also appears that there is a lot of latent heat energy being transported into the Arctic through the ocean currents. There has been recent speculation that the salt water driven currents are moving farther north, transporting more warm water to the ice sheet’s edge. This mechanism may well be behind the continued substantial erosions of sea ice so late in the season. In general, given the anomalous and unexpectedly strong melt this year, the strength of the human caused heat forcing of the Arctic, and the amplification occurring through loss of albedo, increased local carbon releases, and alterations of atmospheric and ocean weather currents outside the range of traditional climate and weather science, all bets are off in predicting a system that has been forced well beyond its natural range of variance.